I never really thought too much about this historic entity, but it’s been on my mind lately. I was first introduced to the workings of the NAACP through the local Uniontown, PA Chapter, then run by Mrs. Jackson and I think Mr. Tracey. I recall membership drives and meeting with the youth. As an adult, the entity would come to mind if Al Sharpton or Jesse Jackson was on the news and of course they were mentioned in many civil rights discussions. Recently, they have been in the forefront of my thoughts because a client of mind received a package from them on a Saturday morning, asking her firm to bid on some work they needed done. Wow! we thought, out of all the firms why us? Really it was an honor to have been hand selected by this prominent organization to be worthy of submitting a bid. Off I went in research of their inner workings, to see how we could cater to their unique and specific needs. I was also fortunate enough to be invited to their Headquarters and see the most famous non profit organization in the Black community at work from the top floor to the mail room. Too bad I couldn’t have brought my kids on this visit, to see the timeline of their work depicted in oversized photographs lining the halls of the building was fascinating. My kids would have really enjoyed being in the presence of this gallery since we are currently reading “Who is Rosa Parks?” on my nook color reader ( at the request of one of their soccer teammates). I’ve told my kids I will buy any book they want…as long as it’s a biography. No joke. My son’s first grade class featured Dr. Daniel H. Williams on the morning announcements this week. The school is doing “Who’s in the Box” Black History Lessons this month. Joseph was so excited to recite his part from memory only to get switched to a more difficult passage the day before taping. He was okay with the last minute change and did fine (Acting may be his calling). I was thrilled at his excitement over learning that Dr. Williams was the first doctor known to do open heart surgery and that he was black. He rushed home to have me Google the Doctor so I could read all about it with him. I love it when kids are excited about learning, also love the blessing that my husband and I have to be able to shoot over to the school at a moment’s notice to photograph his acting debut. August 26th is an historical in my family. My paternal Grandfather died on this date and then seven years later my maternal Grandfather died on this very same day. My maternal grandparents were married on this day and my mother's sister was also married on this day. What does all this mean...absolutely nothing...just a date that casues me to stop and think. Here's to my maternal grandparents who would have celebrated a 75th Wedding Anniversary (I think). This beautiful canvas painting of them was damaged in a house fire 2 years ago...but maybe it can be cleaned...gotta put this on my Christmas things to do list. This what we awoke to...a snow drift at our back door at least 4 feet deep, this door way is 4 feet off the ground. Pretty, Pretty, Pretty, until I shoveled for almost two hours, then it wasn't so pretty. We made it to the basketball hoop, hope to get the rest on Sunday. After hearing about a church's roof collapse, Leah became concerned, this a second story windo that overlooks the roof to our morning room, the drifts are half way up her window. We have to clear a patch for the dog to go potty...yes right at the front door, couldn't even attempt to go out the back door. And to think I drove around the neighborhood last night looking for a sled hill for the kids...Jerry made a 6 ft hill right in the front yard...but we can't get to the garage yet to get the sled out. A welcome sight...city snow plow hitting our street at midnight...I love to see my tax dollars doing ME some good! Oh how I wish I could be in Atlanta for this event. The Program will feature welcoming remarks by Lonnie Bunch, museum director. Preservation Presentations: Four informal basic preservation sessions will take place during the day. One will focus on textiles, a category that includes cloth dolls, flags, hats, clothing, lace, quilts, needlework and table linens. 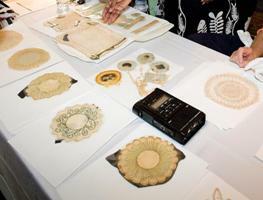 The session on photographs and paper will inform participants on simple inexpensive techniques to keep their family Bibles, historic pictures and important documents such as diplomas and wedding licenses safe from deterioration. A third session of the day explains to potential donors the process of establishing provenance of an object. Participants will learn what is needed to establish and document the age, place of origin and line of ownership of objects with historical value. During the fourth session participants will receive tips and resources for recording and archiving their family’s oral history. Hands-on Preservation: Participants are invited to learn how to properly store letters, pack garments and prepare photographs for preservation storage and presentation. Oral Histories: Participants may record a brief personal memory, a family story or a memory of a historical event. Family members are encouraged to interview each other. Participants can reserve in advance to bring up to three personal items for a 20-minute, one-on-one professional consultation with experts on how to care for them. The specialists will serve as reviewers, not appraisers, and will not be able to determine an item’s monetary value. Objects such as books, paper and textiles no larger than a shopping bag (furniture, carpets, firearms, and paintings are excluded) can be reviewed. Those wishing to have items reviewed must make reservations by emailing treasures@si.edu or by calling toll free, (877) 733-9599. Reservations are not required for those not wishing a one-on-one consultation. Additional information is available at www.nmaahc.si.edu.